“How granting dying wishes is helping people ease the pain of losing loved ones”, published by Sarah Law for CBC News, discusses the 3 Wishes program and how it lets dying patients and their loved ones create memories and find comfort. On August 25, 2017, Ashley’s partner, Darrell, was heading home from an evening with his friends. As he was crossing the street to his Uber, he was struck by a speeding taxi. Darrell suffered extreme brain trauma and passed away on September 3, 2017. McLeish Orlando Partner, Patrick Brown, is currently representing Darrell Smith’s family. During the last moments of his life, Ashley was approached by St Michael’s Hospital 3 Wishes program. When Ashley was asked how she would like to honour her partner of seven years, she thought about one of his lifelong passions, skateboarding. 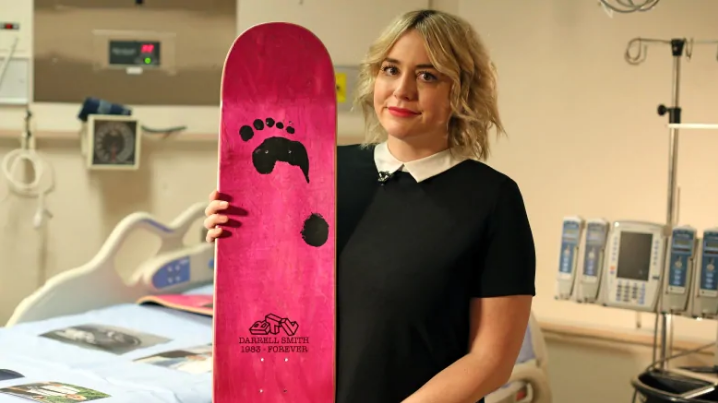 Alongside Darrell’s family, Ashley had painted Darrell’s footprint on a custom skateboard that she had planned to give him as a Christmas gift, a perfect way to memorialize Darrell and bring comfort and closure to his loved ones. More than 200 boards with Darrell’s personal touches have been sold in his honour. The 3 Wishes Program grants dying patients and their loved ones wishes. Their goal is to help family members celebrate their loved one’s life and support those left behind to grieve. Currently, the program is looking to expand to more ICU’s in Ontario hospitals. Financial contributions in support of the 3 Wishes Program can be facilitated by the St. Joseph’s Healthcare Foundation here and selecting 3 Wishes Project from the Gift Designation menu.